Geo Cascade is a chain reaction game. You have to clear the board by creating cascades. Different shapes represent different types of strengths to withstanding explosions or touches. The bigger the shape, the more explosions are needed to get rid of it. Red dots explode into four pieces which move into four directions on the board to hit other shapes. If you clear a board with as few moves as possible you receive a gold medal. If not you might receive silver or bronze. You need at least bronze to reach the next level. 1000+ levels are to be accomplished. We provide free new levels at least once a month. In the achievement section, you find your 100% game completion indicator. The number of times you play the game at 100% are counted as well. New level updates give you the chance to raise your 100% counter again. 100% can only be accomplished by getting all gold medals! Compete with your friends by sharing your game status! - For PHONES and TABLETS: The game board fits even to the Nexus 10 tablet screen! 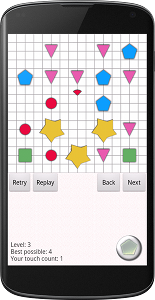 AndroidTapp says: "Geo Cascade - ideal game for logic-loving puzzle fans!" Android Rundown says: "Fun gameplay with engaging scoring system"
Android Quality Index: "Geo Cascade in Top 10 Android games and apps of December 2012!" The Playandroid Magazine says: "Geo Cascade is a pleasantly colorful and fast-paced game"
AndroidShock says: "This cool mind-boggling puzzle is a perfect time killer!" "The most challenging chain reaction game ever"
"Great game Simple, straightforward, and totally absorbing"
"Funny. Addictive...never ending story because of so many levels"